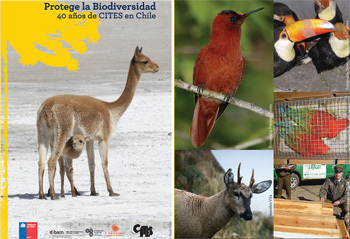 I would like to express my sincere thanks to the Government of Chile for inviting me to inaugurate this exhibition to mark the 40th Anniversary of CITES entering into force in Chile. I regret that I am unable to make it to Valparaiso in person. As you may know, CITES was the third global environmental agreement to be adopted in the early 1970’s, being signed in Washington D.C. on 3 March 1973 – and 3 March is now celebrated each year as UN World Wildlife Day. It was, however, the first such global agreement to enter into force on 1 July 1975, some six months earlier than the Ramsar and World Heritage Conventions. CITES is a legally binding agreement that is regarded as one of the most successful of all international environmental agreements and interestingly the Encyclical Letter of the Holy Father Francis on Care for Our Common Home references the importance of enforceable international agreements and makes positive reference to CITES (see paragraph 168). Since 1975 the world has witnessed growing prosperity, changing consumption and production patterns, vastly enhanced scientific knowledge, phenomenal advances in technology and, above all, exponential growth in global trade. Looking at population figures alone, the world’s population has grown from 4 to over 7 billion people – and that is an additional 3 billion potential consumers of wildlife and wildlife products. Despite these changes CITES remains as relevant today as when it first entered into force 40 years ago. It is a living, breathing convention and one that has evolved over time in response to these changing conditions. It has done so in many ways, including through bringing new marine species, such as sharks and tree species, such as the Alerce and the Araucaria, under CITES trade controls, making best use of emerging technologies, and strengthening cooperative enforcement efforts. Looking at CITES and shark species, none of which were listed under CITES in 1975, perhaps helps to illustrate the point. As it turns out, CITES entered into force within days of the release of Steven Spielberg’s blockbuster movie‘ Jaws’ in June 1975, which reflected Hollywood’s portal of the great white shark. Jaws is said to have perpetuated negative stereotypes and public misunderstandings about the role of sharks and their behaviour. These perceptions have however been changing, especially in light of the science on the unsustainable harvesting of some shark species that could drive them to extinction. It is within this context of changing perceptions and better science that CITES intervened to bring eight species of sharks under CITES trade controls in recent years, including five species being included under CITES in 2013, to ensure that any international trade in these species is legal, sustainable and traceable. The enduring relevance of CITES was perhaps most powerfully expressed through the agreed outcomes of Rio+20 in 2012, where the Convention was described as “an international agreement that stands at the intersection between trade, the environment and development” – and the importance of CITES has just been further reinforced by the UN General Assembly when it adopted the first ever resolution on ‘Tackling illicit trafficking in wildlife’ on 30 July . 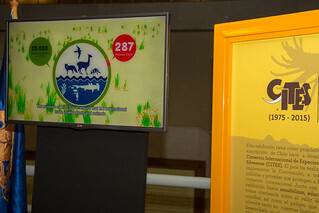 Rio+20 provided an apt description of CITES, which is highlighted by the fact that a significant amount of wildlife and wildlife products are legitimately traded each year under CITES, with such legal and sustainable trade often having benefits for both wildlife and people, such as the trade in the wool of the vicuna, meat of the queen conch and bark of the African cherry tree. And CITES has just recorded its fifteen millionth trade transaction in the CITES trade databases. Over recent years, however, we have been experiencing a surge in illegal trade in wildlife – being wildlife that is traded in contravention of CITES, especially as it affects elephants, rhinos, pangolins but also the iconic vicunas and some precious timber species. This illegal trade is global in nature, is taking place at an industrial scale, involves transnational organized criminal gangs and it is having devastating economic, social and environmental impacts. The importance of CITES in combatting illegal trade in wildlife and facilitating legal and sustainable trade, should a country wish to trade in a species that can be traded under CITES, is greater than it ever was. Firstly, the quality of the original text of the Convention, adopted in 1973 and its evolution over time. It is focused, pragmatic, and establishes a robust international regulatory regime to address international trade in wild plants and animals. It is a regime that has stood the test of time and just last week the Director General of the WTO and I released a joint CITES WTO publication on the relationship between the WTO and CITES as a leading example of how global trade and environmental regimes can support each other and cooperate successfully to achieve shared goals, noting that there has never been any WTO dispute directly challenging a CITES trade-related measure. Secondly, the robust partnerships that have been forged in the implementation of the Convention with a broad range of entities both within and outside of the UN and with both governmental and non-governmental bodies. This has been a strong focus over the last five years in particular with the establishment of the International Consortium on Combatting Wildlife Crime (ICCWC), a joint initiative of the CITES Secretariat, INTERPOL, UNODC, the World Bank and the World Customs Organization – as well as through partnering with the FAO on implementing the listing of sharks and manta rays, and the ITTO on implementing listings of tropical timber species. Thirdly, and most importantly, is the deep commitment of the 181 Parties to CITES to implement the Convention by designating Management and Scientific Authorities, adopting national legislation and enforcement measures, as well as through collaborative cross border efforts. National legislation is the pillar of CITES implementation and national CITES authorities are the engine room of the Convention and have ensured its success. And today we pause to celebrate Chile’s vision and commitment from 1975 to today. CITES is a fantastic example of successful international cooperation combined with national action that has lasted for four decades. In recognizing the efforts of the 181 Parties to the Convention to combine international cooperation with national action it is most fitting that we are here in Chile, which has played such an active and leading role in the implementation and ongoing development of CITES, since it joined the Convention in 1975. Providing deep expertise to CITES processes, including through SAG, CONAF, Sernapesca. And I could go on but I had better stop there. There is one pending obligation that we understand Chile is close to meeting, namely the adoption of national legislation to fully implement all CITES requirements. We expect to be able to announce good news to the next meeting of the CITES Standing Committee in January 2016 in this regard. This brief over view of the support coming from Chile for CITES serves to illustrate why it is that the Convention has been a success and we would like to extend our deep gratitude to Chile for this longstanding and ongoing support for CITES on this special celebratory day. Leaflets prepared for the event.